I'll admit something to you, if I may? I love what I do. I love listening to music. I love that I am entrusted with some people’s music & asked to give some thought to it. I don't take this role for granted and appreciate all the music submitted to me for consideration ... even if I cannot get to it, I do listen to it. There are some folks whose contact brightens my day ... I love it when I get a note through from Gaving Catling over at Twice Removed or a mail from John Koch-Northrup at Relaxed Machinery. They both represent tremendous creativity & I am proud to be entrusted with their work. I also love getting mail directly from the artists themselves and I have come to appreciate the mail from folks like Jeffrey Ericson Allen aka Chronotope Project. Email from him points to a good day ahead simply because I love his music. 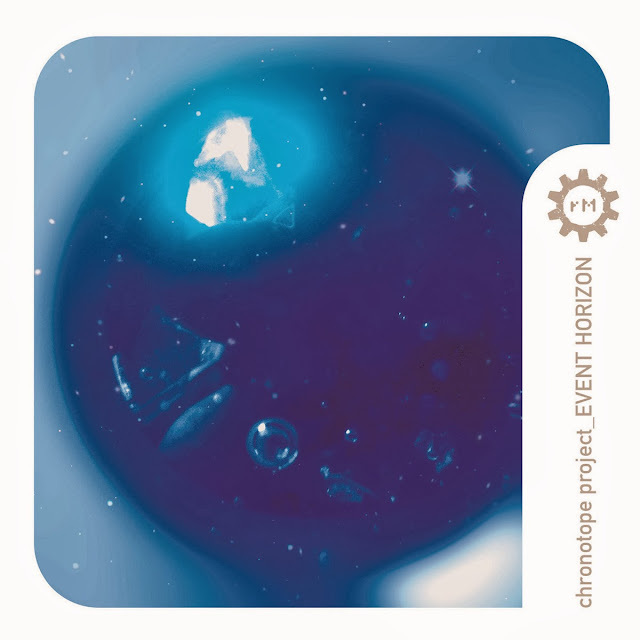 "Event Horizon" by Chronotope Project on Relaxed Machinery is my kind of awesome: ambient soundscapes with a Vangelisian approach to percussion & sound effects. The pictures he paints with sound are simply phenomenal. Just short of 1 hour in duration, "Event Horizon" is the demonstration of someone at peace with their form of expression ... yes, there are moments of evident progressive experimentation; but, for the most part, this release is the work of someone at the top of their game with little left to prove. It exudes a confidence that is deeply reassuring to me as a listener ... a reassurance that is doubled by the fact it is released on Relaxed Machinery. There are no gimmicks or ego-stroking flourishes on here ... just something beautiful. But then that is my expectation. What is on here is sheer beauty refined and defined into sound. From the opening refrain of "Akashic Love Songs" to the dying moments of "Unwinding the Dream" ... this is my kind of ambient. I don't have the words to hand that will allow me to effectively describe the music on "Event Horizon". Expressive cinematic musical journeys comes closest, I guess. Ericson Allen's use of synths, guitar, loops, field-recordings and an extensive use of ’world’ percussion helps to narrate these expansive journeys ... giving form to something formless - a feeling ... the feeling of peace ... of grace ... of serenity ... and, most of all, the feeling of travel and of the journey itself. I particularly like the sound pictures shaped for the second track "Arecibo" ... in particularly the percussion that flies in and out of the present consciousness. It reminded me, in particular, of Vangelis’ soundtrack for "Blade Runner". I've been touched by "Event Horizon" and am so grateful to Jeffrey Ericson Allen for sending me a copy. I would highly recommend it to anyone with a love of cinematic music ... either through ambient or the soundtrack genre.